Do you search the internet for nail art? If you do, you’re not the only one. I would love to be able to do some of the awesome designs I find on the web. Can I add a few coats of polish to my nails, yes. Will these designs come out the same for me, no. Sad right? It’s OK, I’ve come to terms with my disability. Though I can’t execute it, it doesn’t mean I can’t stare longingly at these lovely nails. I found Let it Snow on Steffel’s Blog. 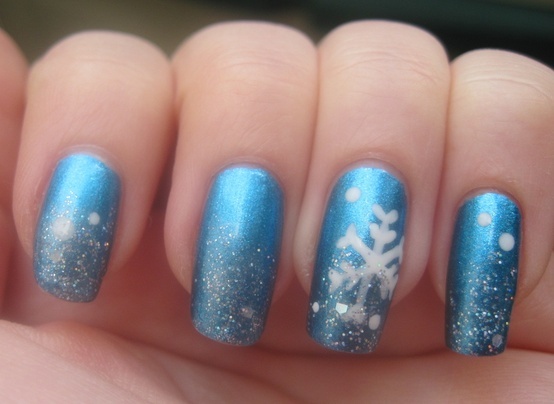 Stef has amazing nail art on her blog. 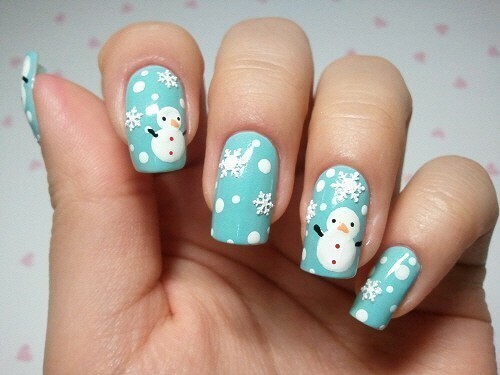 Her winter nail art looks amazing. 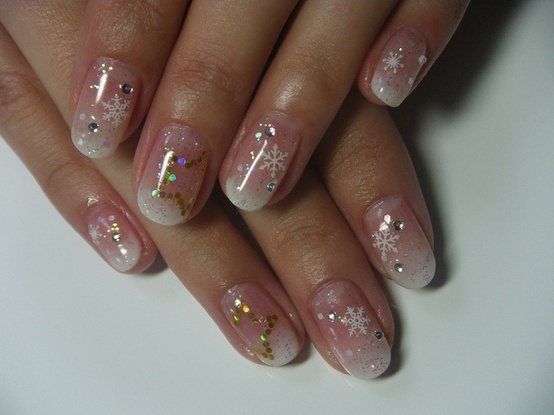 I love this design because it reminds me of that Christmas song “Let it Snow”. I love music videos. I was glad, I was able to find Boys II Men singing “Let it Snow”. They sound amazing and the story line is perfect for the holidays. Hoped you loved their velvety voices. Though these nails are not as sophisticated as the first, it’s nice to have nails to remind you of simpler times. The blue background and snowman made me think of Frosty the Snowman. They are jolly, perky, and full of winter fun! At first I was going to share the Frosty I know and love with you. As I searched on YouTube, I found the real frosty! Yep, this is the vintage version. Blue Silver and White are the perfect colors for Winter Wonderland. I like that there is only one perfect snowflake and the others look like the snow falling. If you’ve seen snow, it looks like the flake on her nails. When it’s snowing hard, it can look like white dots falling from the sky. I love this version of Winter Wonderland because I used to have this Walt Disney Christmas Special. When I was little, I’d watch it all the time. This was before DVDs came out. Then like many VHS in my life. It died…as I was watching it… Needless to say, I was devastated. Thanks to the YouTube, I can watch this video and think about Christmas past. These lovely nails make me think of Merry Little Christmas because they are soft and have a few special details. Since a color nail polish is not used, you can really appreciate the little details. Finding the right Christmas version to this song was a little hard. There are many to choose from. When I found Kermit the Frog. I had to choose this one. The video is beautifully done. Hope you enjoyed it as much as I did! Which nail designs is your favorite? Did you like the song titles for the nail art?